To email a particular officer, please check the “Police Officers” page for a list of email addresses. The New Sewickley Township Police Department is seeking donations from residents and businesses to perpetuate a K-9 program and will be soliciting funds through drives and events held in the Township in the coming months. A K-9 program is a valuable tool in deterring crime, finding missing persons, apprehending criminals, preventing crimes and making our community safer. The K-9 program is part of the police department’s plan to curb vandalism, thefts, narcotics and burglaries. In addition to police work, the K-9 team will conduct demonstrations at schools and special events. The New Sewickley Township Police Department hopes that donations will help defray the ongoing costs of the program. U.S. Immigration and Customs Enforcement (ICE) and Homeland Security Investigations (HSI) are committed to protecting the public and ensuring that the rights of victims are carefully observed. HIS administers the Victim Notification Program which allows eligible victims and witnesses to obtain reliable and timely information regarding a criminal alien’s release from custody. However, victims and witnesses are required to register with HSI and ICE in order to receive notification of criminal notification of criminal alien’s release. New Sewickley Township Police Department now has a permanent MedReturn Drug Collection Unit. 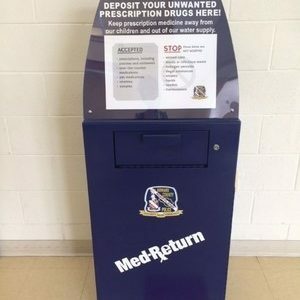 Citizens looking to dispose of excess and expired prescriptions and over-the-counter medications can now visit the safe and secure permanent Take-Back Drug Box, located in the lobby of the New Sewickley Township Police Department. The collection site is open Monday thru Friday 7 am to 3 pm. Drugs can be dropped off with no questions asked. drugs need to be in a sealed container, such as the original bottle or a zip-lock bag. The New Sewickley Township Police Department offers Criminal Fingerprinting. Fingerprinting is offered Monday through Friday 7:00 am to 3:30 pm. If you are unable to make these times, appointments can be scheduled by calling the New Sewickley Township Police Department at 724-774-2473. The New Sewickley Township Police Department requires a current, valid and unexpired photo identification ID for fingerprinting. Please have available when you come to the station for fingerprinting. The cost of fingerprinting is $10.00.